You’re a busy adult. You wake up earlier than you ever wanted to, drag yourself out of bed, and realize you have a meeting to go to in an hour. You’re groggy, and you certainly don’t feel like moving…let alone presenting something in front of your team! You head to your trusty Mr. Cof-fee and place your absolute faith in the machine to make you an amazing cup of coffee that will give you the boost you need. The above scenario is likely one we’re all familiar with. College students rely on the local campus coffee shops to get them through their classes while mom and dad prepare their own coffee in a coffee maker. When it comes to early-morning college classes or getting kids ready for school in time, let’s face it—coffee is a necessity! Due to the prevalence of coffee making machines in the home, however, you might not think too much of it to offer some coffee to someone else—your child. We’ve all heard at least once in our lives that we should avoid caffeine, if possible. More than that, we’ve heard that children should avoid it. But why is this? Simply put, children are not fit to handle stimulants as well as the rest of us. The effects of caffeine in kids can be more extreme than that of sugar, which itself is known to cause hyperactivity and is followed by a “crash.” Adults experience these crashes enough as it is; children will experience them way worse. So what exactly can giving your child coffee do to him or her? Other than the hyperactivity and the crash, it will cause sleeping difficulties. Children need more sleep than adults, and most of them have to wake up just as early once they’re attending school regularly. Therefore, it’s crucial that they get the hours of sleep they need! Allowing coffee at any time in the day may interfere with your child’s bedtime and keep him or her awake, leading to grogginess in the morning. The hyperactivity and the grogginess will make it difficult for your child to concentrate in school. Another negative side effect of coffee-drinking in general is what it is known to do to our teeth. We know that coffee leads to stained teeth, but it also leads to cavities—particularly in children getting their adult teeth. These new teeth have enamel that is still developing, which is easily damaged by the acidity of coffee. The fact that most coffee beverages contain a ton of sugar doesn’t help either! Cavities are definitely the last thing you or your child want to worry about. This page covers more of the effects caffeine has on the body, as does this one—particularly where your kids are concerned. 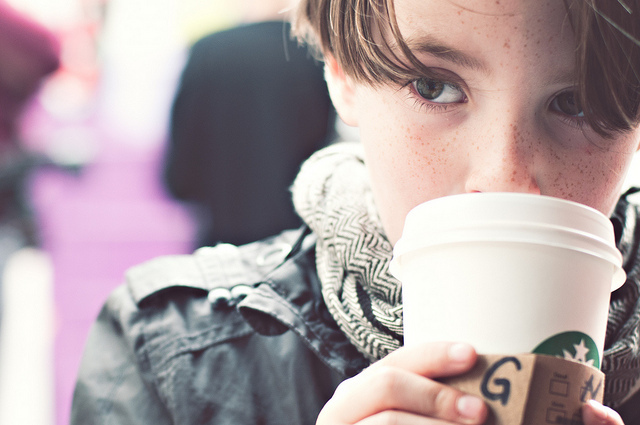 Instead of giving your kids coffee, take healthier steps to ensure their energy levels don’t suffer. A healthy diet—excluding caffeine—will keep them feeling alert. Sleep, however, is the most important thing your child can get! Dante's Inferno with Children Copyright © 2019.